We've exchanged emails in the past regarding my 2008 research trip to the International Tracing Service (ITS) archives in Bad Arolsen to do DP research. A number of people from your DP Camp website responded and asked me for help. I'm still continuing my DP research using the ITS archive records available at the U.S. Holocaust Memorial Museum in Washington DC. I'm working on an article for BRIDGES magazine regarding the airline flights (DC-4 aircraft) that were used to bring DPs to the U.S. and Canada. Another 10,000 DPs were flown from Italy and relocated to Colombia. There were at least 200+ flights to the U.S. My grandmother's first cousin and her children flew over in June 1949 from Germany to Connecticut. I found a couple of reference to DP flights on your website and I sent emails to the two people who had posted them asking for added information. Is there any way you could post a note on your website asking for people who may have flown over as DPs or have information regarding such flights to contact me? There is a remarkable site for military research after 1880 and during World War I. There are large maps to download, images of uniforms, lists of troop units and other valuable information. I have received several photos of men in uniforms we could not identify. There are drawings of the uniforms of "Militaerbeamte: (like civil service attached to the military) with two rows of buttons that may help the list members who sent me those photos. Be sure to click on LINKS near the bottom left of the home page after finishing exploring the rest of the site. The photos of uniforms show the gold belt and sword tassel of officers. The text is in German. If you have a German-English dictionary, you may want to have it on hand when you review these pages. Or go to an online dictionary for the key words that identify photos. The rank ensignia is from highest (at the top) to lowest, on the bottom. The NCO ensignia is just above the lowest, the Gemeiner (private). Why is Russia white? http://www.pravapis.org/art_white_russia.asp Belarus: real or fictitious nation? 1948. Searching for the given name John produced only about 200 entries. The first two Ukrainian settlers arrived in Canada in 1891 followed by tens of thousands until the start of the First World War. Most Ukrainian immigrants of this period were identified on government records as Poles, Russians, Austrians, Bukovinians, Galicians and Ruthenians, arriving from provinces in the Austro-Hungarian Empire. The vast majority of these immigrants settled in Manitoba, Saskatchewan, and Alberta. The second large wave of immigration from the Ukraine occurred after the First World War. These immigrants were welcomed by the already established Ukrainian communities. For more historical information about Ukrainians in Canada and sources available at Library and Archives Canada, seeImmigration History: Ethnic and Cultural Groups: Ukrainian. Passenger lists held at Library and Archives Canada for the Canadian ports of Halifax, Nova Scotia; Montréal and Québec, Quebec; and Saint John, New Brunswick, and for the American ports of New York, New York; and Portland, Maine. Notes about early Ukrainian settlers and pioneer families in Canada gathered by Dr. Vladimir Julian Kaye (1896–1976), a historian, public servant, journalist and author of several books, including Early Ukrainian Settlements in Canada, 1895–1900; Dictionary of Ukrainian Canadian Biography: Pioneer Settlers of Manitoba, 1891-1900; andDictionary of Ukrainian Canadian Biography of Pioneer Settlers of Alberta, 1891–1900. This research tool provides access to 14,793 references to names of Ukrainians who arrived in Canada between 1891 and 1930. Names appearing on passenger lists held at Library and Archives Canada were indexed by the late Walter Zayachkowski and input into this database. All the information appearing on those lists was entered into the database and therefore it is not necessary to consult the documents. However, should you still wish to view the actual passenger list, they are digitized on our website (consult Passenger Lists for more information). Mr. Zayachkowski also indexed the names found in the series called “Sailing Records: Note Books” in the Vladimir Julian Kaye fonds (MG31 D69, volume 25, files 2 to 8, note books 1 to 7, microfilms H-3090 and H-3091). Those names were also entered in this database. If a database entry includes the note, “Fonds contains a card with information about this individual,” it means that there might be more information about the individual in the fonds. Note that Mr. Zayachkowski included surname variations in his index as well as some alternate names, based on his knowledge of Ukrainian names and his research in other information sources. You can also enter any term in the keyword box such as port, occupation, nationality etc. When you have entered your search terms, click on "Search." The number of hits found will be shown at the top of the results screen. How to Interpret the Results - Your search results will be posted as a results summary list from which you will be able to obtain an item description. Records from passengers lists. The lists are digitized and can be viewed on our website. Consult Passenger Lists to find out how to access digitized lists and different databases. Do not submit copy requests for records that are already online. Records from the Vladimir Julian Kaye fonds (MG31 D69). The records are not digitized. Consult Access the Records for options such as ordering copies and viewing microfilms onsite. Include the full details from the database entry when submitting a copy request. Read the description of the complete collection. Consult the Finding Aid to see the list of contents for each volume. Series O is titled, “Research material on Ukrainian pioneer settlers: sailing and naturalization records 1891-1900, obituary and death notices,” volumes 25 to 27, microfilms H-3090 to H-3096). Series P, Q and R also contain material of interest to genealogists. Note that only the information from volume 25, files 2 to 8 (“Sailing Records: Note Books”) is included in this database. However, much of the material was published in these books: Dictionary of Ukrainian Canadian Biography of Pioneer Settlers of Alberta, 1891–1900 (AMICUS 4970795) and Dictionary of Ukrainian Canadian Biography, Pioneer Settlers of Manitoba, 1891–1900 (AMICUS 69961). I used the German spelling of Chernovitsi (Czernovitsi). So far I have dug up info about the village of Russisch Banilla, which was two villages known as Banilla de Sus and Banilla de Chos (Jos). One village up stream on the Chermosh River and known as Banilla de Sus, the other village down stream known as Banilla de Chos (Jos) and in 1776 the Austrians combined and named it Russisch Banilla. I have maintained the original names and have not Ukrianianize the names. Am staying with the spelling of names and places as they were at the time in history. Locals that were conscripted into the Austrian Army from Bukovina reported to the K.K Common Army in Czernoivitsi (Chernivtsi) and the units were under the control of the XI Army in Lemberg, now Lviv. That is how the army records are now in L' viv. Any further info would be greatly appreciated. Displaced-Persons - Ein Nachkriegsproblem http://www.geschichtsatlas.de/~ga2/index.htm A problem after the war. CENTRAL EUROPEANS TO DOCUMENT WWII - ERA EXPULSIONS. One week before the planned EU enlargement, six Central European countries agreed in Berlin on 23 April to put behind them lingering disputes over people displaced before, during, and after World War II, Reuters reported. Austria, the Czech Republic, Germany, Hungary, Poland, and Slovakia agreed to create a network of documentation centers on displaced people. "Together with our eastern neighbors, we have today set in motion a process of understanding," said German Culture Minister Christina Weiss. "For the first time since 1945, we have been able to put the debate at a political level over expulsion and forced refuge in the 20th century into a European framework." Plans announced last year by the Sudetendeutsche Landsmannschaft, which unites ethnic German expellees and their families, to set up a center against expulsions prompted outrage among Germany's neighbors, who said their people also suffered as a result of the war. Circassians are an ancient people of the Northern Caucasus (between the Black sea and Caspian sea) of Russia. Russia invaded our lands in the 19th Century and forced about 500,000 to emigrate to Turkey, then later to Syria, Jordan and Israel and other countries. I'm writing a book on our people who came to America in 1923-1951-1967-1973 and to the present date. 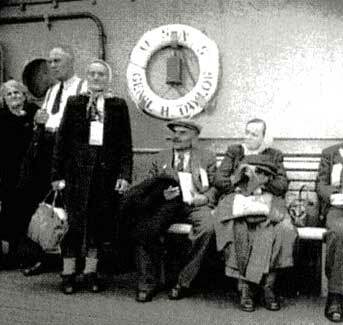 My beginning starts with many of our elders who left the North Caucaus and migrated through Europe(1944-1948) and the Middle-East and finally arriving in America during several waves of emigration. Today we have 6,000 Circassians in Northern New Jersey and about 2,000 in California. The memorial is located in Denmark Frøslevlejren a few miles north of the border in the middle of the Padborg Frøslev plantation. Frøslevlejren was in 1944 originally as a police detention facility, that is built as an internment camp for Danish resistance fighters. Operated by the SS, but it was also contrary to the original arrangements as a transit camp to the concentration camps in Germany. The warehouse, although designed for 1,500 prisoners, housed up to 5,500 prisoners (spring 1945) who had to perform forced labor. After the liberation on 5 May 1945 Frøslevlejren not closed but served under the name Camp Faarhus from now on the internment of German or ethnic German spies and sympathizers and Danish collaborators. Frøslevlejren as a prison camp was operated in this manner until the fall of 1949 and thereafter, from 1 November 1949, it served under the new name Padborg camp as a barracks for different groups of Army and Air Force. Bannered website with French language introduction....A-Z Pages of numerous named WWII French Resistance members with DOBs and dates & places / camps of execution. Sombre and moving but helpful and useful. “THE life of the kingdom of Galicia and Lodomeria was short and sad… and few people mourned its passing.” So wrote Norman Davies in 1981 in his magisterial history of Poland. Poverty in Galicia in the 19th century was so extreme that it had become proverbial—the region was called Golicja and Glodomeria, a play on the official name (Galicja i Lodomeria) and goly (naked) and glodny (hungry). The largest and most populous crownland of the Austro-Hungarian empire, occupying a swathe of what is now south-east Poland and far western Ukraine, was also by a large margin its most backward province. Yet since the end of the cold war, and in the past few years especially, Galicia has been the focus of considerable interest, particularly in relation to Polish and Ukrainian national identities. A new exhibition, “The Myth of Galicia”, which has taken four years to assemble, opened recently in Krakow and will later travel to Vienna. The 600 objects include maps, photos, paintings, sculpture and cartoons. They explain the emerging mythology of a region that was taken by the Austro-Hungarian empire from Poland after the first partition of Poland in 1772, and lasted until 1918 when the Habsburg empire’s fate was sealed. The show looks at the creation of Galicia before examining Polish, Ukrainian, Austrian and Jewish perspectives and lastly “Galicia after Galicia”, the contemporary mythology in which Galicia is a brand of bottled water and soup. The view was rather different for Poles and Ukrainians, in particular in southern Poland and western Ukraine. Galicia became their Piedmont, the place from where the restoration of an independent Polish or Ukrainian state could begin. In the course of the 19th century, they began to feel ever more strongly about their respective imagined nations and grew more resentful of their Austrian colonisers. Outside Europe, it is the descendants of the 2m Galician emigrants to America in the 19th and early 20th century who are keeping the myth of Galicia alive. In Europe, Galicia is a central element of Poles’ national identity and of Ukrainians’ search for a European identity. “The latest proof of the political significance of the Galician heritage has been the contribution of its Ukrainian parts to the success of the Maidan this year and last year,” says Mr Purchla. For many Ukrainians today Galicia is a beacon of Western civilisation. Whatever its flaws, this Austrian invention is relevant and alive. The settlement that we reached with the German defendants was for compensation for slave and forced labor. This settlement was limited to surviving former laborers. Therefore, if you were born in a work camp, I do not think you would have been eligible since you would have been too young to work. The deadline is over but you can ask what transpired. I hereby apply for payment of a Pension based on the work I did in a Ghetto. Please promptly forward me all forms, which I need to complete. I am looking forward to hearing from you. http://www.archive.nrw.de/index.asp website (in German) contains addresses of municipal archives, state archives, archives of industrial firms, university archives, church archives and private archives and gives you basic information: address, opening times, archival sources. The data on sources vary in quality as every archive is responsible for updating the data and only bigger archives manage to do so. Long list of German archives, in., e.g., Dresden, Leipzig, Thuringia, range of other localities with preceding advice about foreign workers / forced and voluntary workers in Reich from 1930's and system of taxes, insurance, and other deductions from their wages. Good advice about how to track records with possible links to individual workers' records. Yes, the SS did, indeed, send shiploads of prisoners out into the Baltic Sea with explosives on board. Some of these ships were bombed and strafed by Allied, usually Soviet, aircraft or torpedoed by Soviet submarines. If you want accurate information about this go to www.feldgrau.com = largest website, mainstream and tightly moderated, about the history of the German Armed Forces 1918 - 45. Go to the SS/Waffen SS forum and post a request there for information about these boatloads of prisoners. Feel free to say that I referred you to the site. One of the moderators of the SS-Waffen SS forum, Mark Yerger, is one of Europe's foremost authorities on those organisations. How the military handled the population after the surrender, separating the Nazis from the general population, sending DPs home to their respective countries, food shortages and feeding the starving population, bombed out homes and factories, rounding up abandoned children and reopening schools; work of the SHAEF* (Supreme Headquarters Allied Expeditionary Force) under the command of General Dwight D. Eisenhower. 2. rising criminality of the DPs, although altogether not more highly than criminality in German large cities. 3. Right of domicile for DPs starting from 1951 on pressure of the west Allied. " www.memorial.de - the site of the German equivalent of Memorial Moscow / St Petersburg / Russia, etc. This site is in German. Aufklärung und Erinnerung vergangenen Unrechts sind Ausdruck des Stellenwerts von Freiheit und Menschenrechten in einer Gesellschaft. MEMORIAL Deutschland e.V. ist den Prinzipien von Toleranz und Gewaltlosigkeit verpflichtet und setzt sich für die historische Aufklärung sowie für die Wahrung der Menschenrechte in Russland und in den Ländern der ehemaligen Sowjetunion ein. 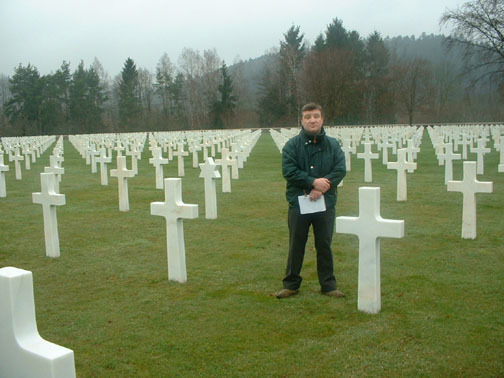 In his book, Crimes and Mercies (1997), James Bacque describes how he confronted New York Times reporter Drew Middleton with evidence that after the war, the U.S. starved to death over one million German POWs. "What Middleton told me basically was that, yes, he had lied in 1945 and no, it did not matter to him or the New York Times if I exposed this." "Middleton's sense of security, his sense of the New York Times' power, took my breath away", Bacque writes. "But worse than that, Middleton did not care about this atrocity... the New York Times witnessed it, then denied that it happened. And has gone on denying it into the 1990's." Bacque estimates that, during the Allied Occupation (1946-1950) an additional eight to twelve million Germans were deliberately starved to death. The war did not end in 1945. For five additional years, Germany was subjected "physical and psychic trauma unparalleled in history." Civilian Internment Enclosures (C.I.E.) and Hospitals, Internment Camps (US Zone), stamps, post cards etc. "We were all Displaced Persons, country-less refugees, who had lost our parents and grandparents, our families and our homes, our churches and our names, everything. It had all been left behind, buried in the great European grave yard that stretched from the English Channel to the Urals and from the Baltic Sea to the Mediterranean. And here we all were on this former [US Navy] troop ship, coming to start a new life in America. We could not have imagined what we would find and what we would become." "It was only for a short time that they felt secure and were protected from Stalin's terror. In 1944 the Germany army was forced to retreat. The Soviet army was coming closer to the villages in South Russia. Everybody understood that all German colonists had to leave their villages forever. Treks, with the last horses they had, were prepared for the long journey back to Germany. Actually they were destined for to the district "Warthegau" in Poland were they first had to be registered by the German government. http://www.u-boat-reich.co.uk - In depth look at German U-boats, U-boat Types, U-boat Commanders, U- boat Flotillas, Of WWII. Combat history, technical data and photos, development history. "Compared to the number of people who are familiar with the Jewish holocaust, how many people heard of the Armenians genocide, for example, in which 1.5 million Armenians were allegedly systematically exterminated at the hands of the Ottoman Turks? * How many people heard of the Algerians alleged 1 million martyrs during the 1950s bloody war of independence from France, or, even what could well be the 20th century's worst holocaust ever, Stalin's Red Holocaust in Eastern Europe in the 1930s and 40s where over 7 million Ukrainians, Poles, Lithuanians, Latvians and Estonians were murdered, starved to death, or died in Stalins death camps? Just to mention a few. Not quite enough people, I am sure. It is unfair to our children to teach them unrealistic or politically orchestrated history; it is also unfair to the (deceased) genocides victims or their existing descendents. Fairness and objectivity are the key, and that means curricular inclusiveness of the world's holocaustal accounts. According to this table, Slavs were killed at twice the rate of the Jews. Also, it shows the heaviest democide at over 12 million USSR population (Univ. of Hawaii). Remember, that Ukrainians were listed as citizens of USSR and Poland; and Hitler occupied Ukraine for 3 years before he entered Russia proper. Who is and Who Isn't a Holocaust Victim? Next Generation Foundation – the bearers of the Holocaust and Heroism Legacy, would like to enlarge its list of "children" and "babies" that either arrived at, or were born in the Displaced People camps in Germany, Austria and Italy, and the list of those who were born in Cyprus to Holocaust survivors who resided at refugees camps between the years 1945–1949. 1945-1952 • Processed by Marek Web in 1986. Additional processing and EAD encoding by Sarah Ponichtera in 2014. My name is Angie Seffker-Cope. I am a librarian at UWM Libraries, American Geographical Society Library which is one of the largest map and geography libraries in the United States, second only to the Library of Congress. This should be a great resource for genealogists and other researchers and I hope you enjoy! The history of military engagements in the U.S. is deeply entwined with the history of the country's overall development. Most of our readers are currently in the military, and considering pursuing higher education. With that it mind, we made this list as a way to look back on 100 years of military history that has shaped our country. We're sharing this post across the web through social media and other channels, and if you could find a way to share it through your site as well, I'd really appreciate it. I've also attached a medal graphic honoring your sites inclusion that you can display anywhere you'd like. Thank you so much for maintaining such a useful site. It is my hope that our readers visit and learn much from it. Please let me know if you have any questions or feedback.